Fallout 4 - am I a Synth? Is the player character in Fallout 4 a synth? The game doesn't answers this question directly, as far as I know. as a Synth becoming the new leader of the Institute. 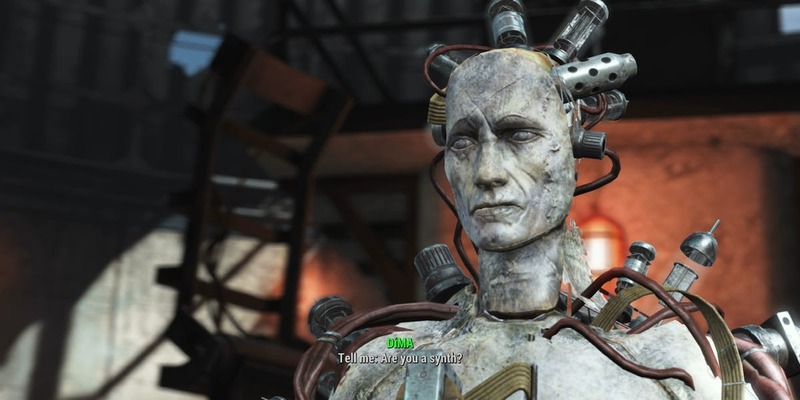 Is the player character in Fallout 4 a Synth? What evidence exists (either in-game or comments of developers) that support the answer? Father refers to letting you out as "an experiment of sorts", and "there was no longer a reason to keep you suspended." Every other cryo pod's occupant died due to life support failure. Why didn't you? The only reason Father can give for keeping you on ice for his entire life is "there wasn't really a reason to let you out." The "experiment of sorts" referred to whether or not you'd track him down - but consider: what exactly are the odds of someone emerging from a vault with a 10mm pistol and taking on the Commonwealth? IF the experiment was about whether you'd track him down, then your survival was not a variable, it was guaranteed. Guaranteed by the fact that you're pre-programmed with enhanced combat protocols, and can be rebuilt if destroyed. Father "knew" you'd survive. As his successor, he "knows you'll do the right thing". He "KNOWS" an awful lot about your behavioral practices. When you tell him you love him, his response is "I can see that you do. It's remarkable." Another line of his is "As remarkable as our synths are, they can be... dangerous without proper supervision." Another, "You mean the child? It's a fascinating project, really. There are issues to be solved, of course, but we've made remarkable progress." When talking about synths, he sure uses the word "remarkable" a lot. "Did you think we would not see what you have done?!" - unless the Institute has developed a scientific crystal ball and built sophisticated fortune telling robots, they saw what you did because your synth brain is transmitting its input data to the Institute. This response is just me exploring the idea. I hadn't thought about it before. There's definitely evidence to back up the theory. And while it would be easy to say "there's no evidence that you're human, either!" - how could there be? The fantastic journey of the player is not, to me, evidence that they are synth or human. The game stars them because if it starred a feral ghoul perma-locked in a shipping crate, it wouldn't be a very fun game. The game stars you because you're the hero of the story - so it's not evidence either way. The hero accepting the "I kept you frozen because there wasn't a reason to let you out" line is like the synths in Westworld saying "It doesn't look like anything to me." Here's one reason: because you survived the life support failure of every other pod, the Institute must have been monitoring your pod, or supplying it with power. If Father is really so emotionally disconnected (a concept his character seems to frequently not adhere to) then pressing the "thaw" button is less of a drain on Institute resources than supplying your pod with power. There's your tiny friggin' reason, sonny. I talked myself into it. Player is a synth. 100%. Okay... 99%. They Made it so you as the Roleplayer of Nate/Nora can choose wether or not your Character is a synth or not.